Start and end in Tel Aviv! 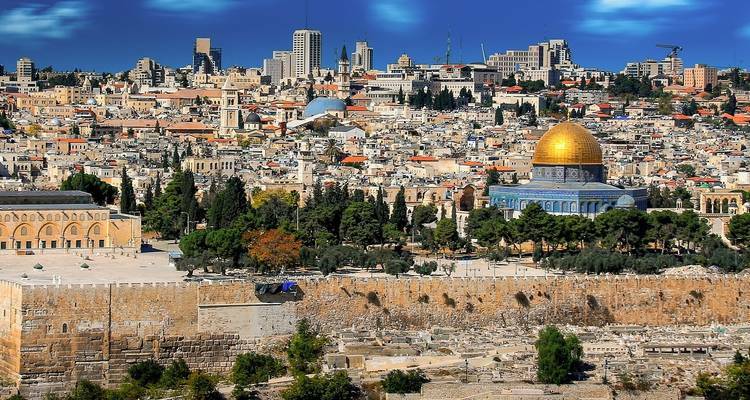 With the discovery tour Journey Through the Holy Land - Faith-Based Travel, you have a 9 day tour package taking you through Tel Aviv, Israel and 9 other destinations in Asia. Journey Through the Holy Land - Faith-Based Travel includes accommodation as well as an expert guide, meals, transport. Our guide for Jordan Tour, Suhaib was fantastic! - he was very organised and knowledgeable. Everybody loves him. Is the accommodation included in the packaged price? Yes, the accommodation is included. I want to be baptized in the river of jordan, is it possible to have during during the trip? That would not be an option as part of the trip, so it would have to be something you would need to look into independently and organize during your free time on the tour. A trip note - which contains essential information about your trip will be given to you. Information such as the daily itinerary, where to meet on the first day, what time the trip starts, how to get to the joining point hotel, included activities, visa information, etc will be mentioned in there. Please contact us for this. Recommended for Israel. Ideally 2 weeks before travel. Recommended for Israel. Ideally 2 months before travel. Start and end in Tel Aviv. TourRadar only requires a deposit of $99 to confirm this Globus booking. The remaining balance is then payable 50 days prior to the departure date. For any tour departing before 9 June 2019 the full payment of $2,507 is necessary. No additional cancellation fees! You can cancel the tour up to 50 days prior to the departure date and you will not need to pay the full amount of $2507 for Journey Through the Holy Land - Faith-Based Travel, but the deposit of $99 is non-refundable. Covering a total distance of approx 462 km.